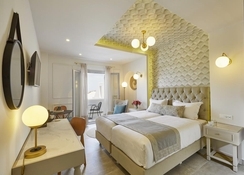 De Sol Hotel & Spa is an all-inclusive family friendly hotel in Fira, in picturesque Santorini with its sloping streets and white-domed houses and churches. The lovely hotel features a swimming pool with sun loungers and magnificent views over the east side of the island and invites guests to enjoy a comfortable stay with warm Greek hospitality amidst idyllic surroundings. The well-appointed guest rooms in the hotel feature flat-screen TV with satellite channels, free Wi-Fi, furniture and an en-suite bath with shower and free toiletries. 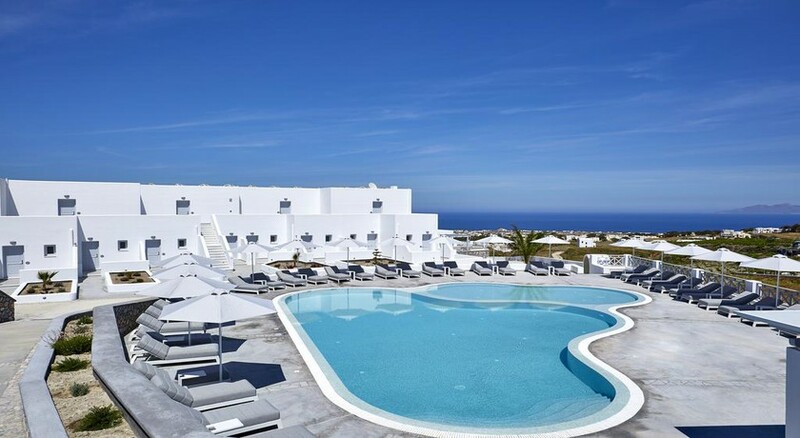 The hotel is located in Fira, in picturesque Santorini with its sloping streets and white-domed houses and churches. The lovely hotel offers magnificent views over the east side of the island. While the port is 2km away and Santorini Airport is 4 km away. Guests are provided with free shuttles to the town and back. Rooms come in the type Standard, Superior and Cosy Family type catering to space and state requirements of the guests. 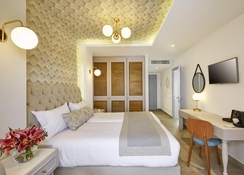 The spacious rooms in contemporary décor, come with modern furniture and amenities and come with free wi-fi, air-conditioning, safe box, telephone, hairdryer, mini bar (additional charge), coffee facilities (additional charge), bath amenities, bathrobes and slippers. Elegant suites and villas with jetted bathtubs and private pool are also available and offer superb accommodations in unmatched luxury. De Sol Hotel & Spa serves a hearty, healthy breakfast with an array of sweet and savory delicacies, fresh fruits and vegetables, yoghurt from Santorini with delicious pies and pastries. A Mediterranean restaurant catering the gastronomic treasures of the Theran and International cuisine made from the freshest of ingredients is on the site and guests can relish the lip-smacking cuisine with brilliant Aegean Sea views and Champaign or local wine. Packed lunches are available up on request. De Sol Hotel & Spa has a swimming pool and kids’ pool and terrace besides access to the private beach. There is Yoga classes and a fully equipped gym for those who wish to stay active. 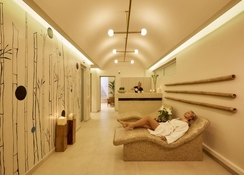 There is a lovely Spa and Wellness center with steam room and Jacuzzi offering rejuvenating massages and therapies, truly an oasis for the body and mind. The hotel has facilities for diving, hiking and bicycle rental.